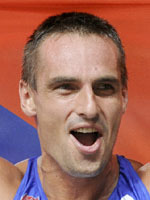 Czech Republic decathlete Roman Sebrle wrote his own page in the athletic's history books on May 28, 2001 when he became the first man to break the mythical decathlon 9000 points barrier by recording a total of 9,026 in Gotzis, Austria. After spending many years in the shadow of compatriot and triple world champion Thomas Dvorak, Sebrle has since gone from strength to strength and heads to Beijing as European, world and Olympic champion. The first whiff of greatness came with a silver Olympic medal at Sydney followed by the world indoor title with an inspired performance in Lisbon in 2001. Then came the staggering five personal bests at Gotzis to smash the world record and mark him out as the man to beat at every meet. Ruled out of the 2001 world championships in Edmonton by injury he was in rampant mood in 2002, landing both the European indoor and outdoor titles. Paris in 2003 provided him with a disappointing silver medal as sad-faced American Tom Pappas surprised everyone by pocketing gold. Ahead of the Athens Games he then turned in the best performance of 2004 with 8842 points at the very same Gotzis stadium he had set his world record, incidentally knocking Pappas into second. At the Athens Games Sebrle finally got it right in his dreaded pole vault discipline as well as a putting in a stunning discus performance when setting an Olympic record of 8893 points to beat American Bryan Clay, who finished with 8820. At Helsinki for the 2005 worlds Olympic Clay turned the tables to beat Sebrle into second with a lead of more than 200 points during a meet marked by bitter cold winds and heavy rain. Sebrle was disappointing in the javelin and shot and underperformed at the pole vault. But he retained his European title in 2006 at Gothenburg thanks to impressive performances in the long jump, high jump and 110m hurdles when a season's best 8,526 points left him 170pts ahead of Hungary's Attila Zsivoczky in second at another freezing meet. Hit by a javelin while training in South Africa in January 2007, the wound was 12cm deep but astonishingly needed only 11 stitches after missing anything of importance, even muscle. He was back in training a week later. At Osaka 2007, where Clay retired injured, he won his first world title at the age of 32 after trailing Maurice Smith until the penultimate event. A brilliant javelin throw of 71.18m saw him edge clear of the Jamaican and then hold on in the 1500m for a knife-edge 32 point victory with 8,676 points. He'll be the man to watch at Beijing, although his training has been hampered by thigh strains in 2008.